articles, cinemas, drama, film festival, films, movie clips, nesw & Gossip, news, news & Gossip, PEOPLE, POLITICS, POSTS, previews, thriller, trailers, Uncategorized, updates, virals, WTF?! As we approach the end of summer that means 2 big film festivals are soon approaching Venice and Toronto, so we’re getting the first stage of the marketing for the festivals is hitting the net and this morning we have political intrigue in George Clooney’s THE IDLES OF MARCH.The movie is the latest directoral feature from Clooney a movie he also stars in alongside current man of the moment Ryan Gosling alongside Marisa Tomei, Philip Seymour Hoffman, Evan Rachel Wood and Paul Giamatti. 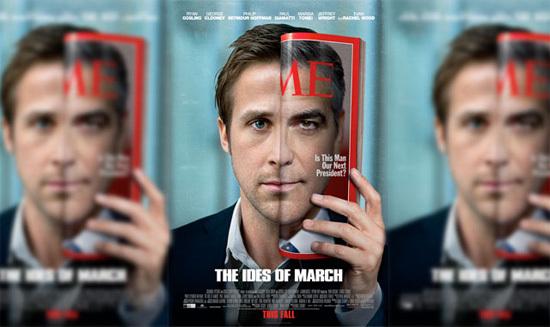 Clooney plays Governer Mike Morris in a intriguing story on the days leading up to the presidential primary elections in Ohio, Gosling plays Morris whiz kid press secretary everything going great until Paul Giamatti’s character get in their way. It’s an intense political flick which has a cynical look at the world of the American political system which should stir up the Republicans and Democrats in the process, it will probably get a few Oscars nods when the voting commences at the end of the year.The movie is the opening flick for this years Venice Film Festival on August 31st as well as been part of the TIFF selection too. THE IDLES OF MARCH will be released in UK&Ireland from October 28th (October 7th USA). → Watch Part 2 Of CONAN THE BARBARIAN Jason Momoa Answers Fans Questions!